inside the guitar’s body. The neck is a sandwich of walnut, carbon fiber & maple. 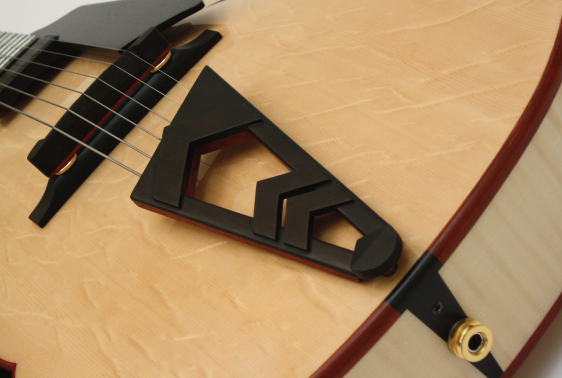 This innovation offers maximum playability and accessibility to the complete fret board. The carved top is made of bear-claw sitka spruce. 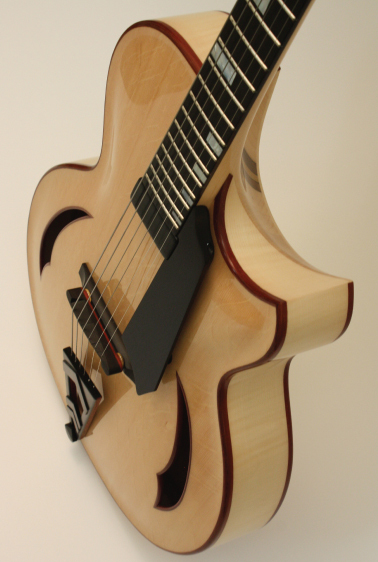 This is a 25″ scale Archtop guitar. The Eraser’s tailpiece is made of walnut, paduk and ebony, cladding a custom brass interior structure. There is a brass anchor adorned with a custom ebony button. Both the pin and the tail piece have a beautiful chevron design incorporated into them. The Eraser has a Kent Armstong floating pick up beautifully held in the finger rest with a thumb wheel volume control. What’s the price on this eraser archtop? If its within my budget I’ll buy one for sure. Thanks and good luck on building more beautiful instruments! My Eraser arch tops start at $6500.00. Depending on the choice of woods, details and electronics if you want them, they go up from there.